It’s such a special time for the year for everyone, when we get the chance to eat, drink & be merry, reconnect & recharge, switch off the phone and switch on Christmas lights, do a lot of things or do not very much at all (delete as appropriate to you!). Many of us will have the opportunity to see a bit more of our country over the holidays so we figured that it would make for some great planning if we were to have our #Scotlandhour earlier on in the month to assist, and we’re also aware that during the break, many of us lose track of the days, so having our normal “last Wednesday of the month” slot wouldn’t be the best. We are delighted to have as our Guest Hosts for this month @edhogmanay the team behind the world famous Edinburgh Hogmanay celebrations. 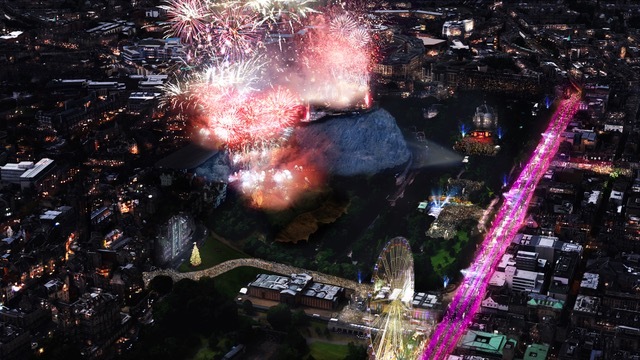 Bringing in the New Year in Edinburgh is something which people travel from all over the world to do and this year’s revamped celebrations will once again put Scotland at the very heart of the world’s party! They’re kicking off with the Torchlight Procession on Saturday 30th, partying in the streets on Hogmanay itself and of course, punching through the hangover with the bracing Loony Dook in the Firth of Forth on New Year’s Day! Brand new for January 2018 is Message from the Skies, a 25 day project which will see leading Scottish writer Val McDermid’s story ‘New Year’s Resurrection’ told through projections and multimedia onto Edinburgh’s buildings and landmarks. Here are this month’s questions to allow you to get ready and we look forward to seeing you on Wednesday 13th December, 9-10pm! As always, remember to include #Scotlandhour & A1 for your answer to question 1, #Scotlandhour & A2 for answer 2 etc. Our thanks to everyone for their support and engagement so far in 2017, and let’s sign off in #Scotlandhour style!